Stepping onto Philadelphia’s Festival Pier Oct. 3, was like stepping back into the vibrant decade of the 1960s. The impassioned music, intense visual effects and incredible dynamism of each band came together to form a time machine that influenced all the senses and brought the whole audience back to the time of psychedelia. The audience and performers could not have possibly asked for a more scenic night at Penn’s Landing. The water gleamed with lights cast from the bridge while the occasional strong gust of wind helped to cool down warm faces of the tightly packed crowd. Photo Courtesy Tastemakers Magazine. 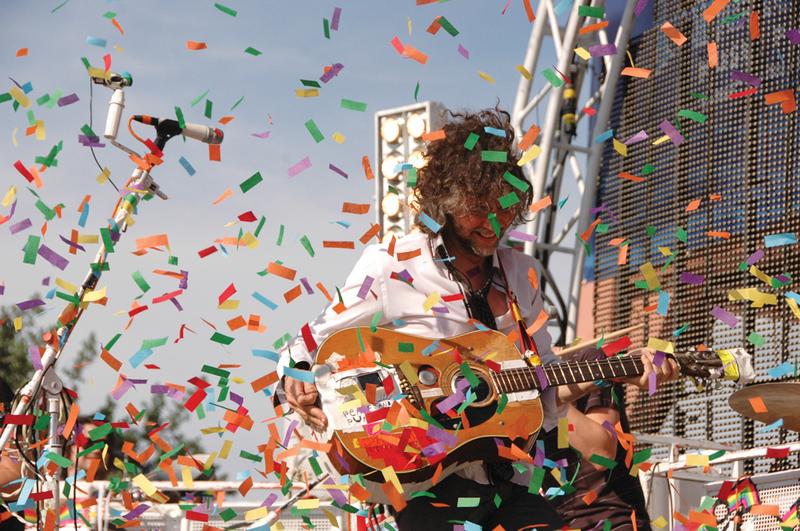 The Flaming Lips’ lead singer and guitarist Wayne Coyne (pictured) was as eclectic and entertaining as usual for fans crowding Festival Pier at Penn’s Landing Oct. 3. The Ghost of a Saber Tooth Tiger, the opener for the show, got the audience up and moving as more and more people joined the already large crowd to hear the atmospheric folk and psychedelic pop duo Sean Lennon and girlfriend Charlotte Kemp Muhl. The duo and band members sounded as though they had been playing together for years, keeping up with the audience and creating an intricate experimental psychedelic sound. They had a very quirky look that somehow managed to mesh well with the other performances of the night, Tame Impala and The Flaming Lips. Australian newcomers Tame Impala played to impress with a set list that featured their biggest dream pop hits, including songs off their critically acclaimed album “Lonerism,” which got them their initial buzz. Opening for The Flaming Lips is not an easy job, but Tame Impala was able to keep the audience’s complete attention with an effervescent and pulsating screen that interpreted groovy images in sync to lead singer Kevin Parker’s guitar playing. Parker himself stopped to have a little jam sesh and illuminate the awesome effect. They played a pretty humble yet impressive set with plenty of extended drum and guitar solos. Once Tame Impala left the stage, the atmosphere in the crowd became filled with talking and excitement in anticipation of the already eccentric performers of The Flaming Lips. Intricate lighting, confetti and spaceships, oh my! The Flaming Lips did not disappoint with their innovative set and stunts that emphasized the daunting beauty of their new album “The Terror.” Crew members were dressed in lab coats, praised for being an incredibly important part of the production as they created the groovy backdrop and harmonious setup for the band. The stage show included frontman Wayne Coyne standing on top of a glowing podium made of space helmets and doing what he does best — being obscure and meaningful at the same time. The band opened with “Look… The Sun Is Rising” as the audience roared with utter bliss. Sending some sort of message, Coyne gently cradled a plastic baby at the beginning of the set while simultaneously throwing confetti onto the crowd and keeping the aura of the night about love and sadness. Although it would have been widely appreciated to hear some of the band’s old material, fans clearly enjoyed the show. The crowd screamed along to encore song “Do You Realize? 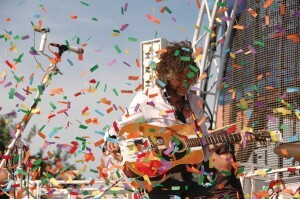 ?” and all was well in the psychedelic sci-fi world of The Flaming Lips.